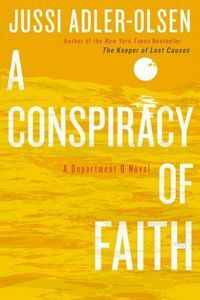 A Conspiracy of Faith by Jussi Adler-Olsen: Synopsis and Online Purchase Options. Synopsis (from the publisher): Detective Carl Mørck holds in his hands a bottle that contains old and decayed message, written in blood. It is a cry for help from two young brothers, tied and bound in a boathouse by the sea. Could it be real? Who are these boys, and why weren't they reported missing? Could they possibly still be alive? Carl's investigation will force him to cross paths with a woman stuck in a desperate marriage — her husband refuses to tell her where he goes, what he does, how long he will be away. For days on end she waits, and when he returns she must endure his wants, his moods, his threats. But enough is enough. She will find out the truth, no matter the cost to her husband — or to herself.